A great addition to the rest of our products to cover your hand-controls. Detail is often the difference between good & great. Our Perch Covers fit in that category! Installation is quick & easy. Precio original:76.00€ Precio Oferta:42€ IVA y portes incluidos. For those with Stiletto ISO-Grip end caps, these make a perfect match that will help complete the look! These axle nut caps fit right up close to the slider to eliminate unsightly gaps. Fits all Honda VTX1300´s and VTX1800´s. Compare our Drive Shaft Cover to others on the market. This setup sets a whole new standard. Two-piece, chrome-plated stamped steel construction covers both the differential & shaft tube giving the appearance of a completely chromed assembly. Precio original:153.50€ Precio Oferta:63.00€ IVA y portes incluidos. Precio original:112.00€ Precio Oferta:55.00€ IVA y portes incluidos. Details make the difference! In just a few minutes your front brake caliper can spring to life with this brilliant chrome cover. Styled to complement the Rear Caliper Cover, the pair provides a balanced, integrated look. Installation is a snap with high strength peel-&-stick adhesive. Valido para: Honda VTX1300C 03-09 y Shadow 750 Spirit/Phantom 08 en adelante. Precio original:57.00€ Precio Oferta:27.00€ IVA y portes incluidos. Precio original:45.00€ Precio Oferta:25€ IVA y portes incluidos. This is the ultimate front end dress-up kit for the VTX. We offer a 5-piece set that includes a one-piece cover for the top triple clamp, chrome fork tube caps, & covers for the lower triple clamp for the VTX1800C. Precio original:102.00€ Precio Oferta:40€ IVA y portes incluidos. The flowing appearance of the stock VTX Retro fender is classy, but it really cries out for these precision fitting molded chrome inserts - by far the finest available! Don´t confuse ours with other ill-fitting, poor quality versions on the market. Precio original:43.00€ Precio Oferta:18.00€ IVA y portes incluidos. A stunning replacement for the dull, stock, black components found on your bike. The chrome-plated contours have been smoothed & molded to provide a flowing appearance. The right side cover has a stylized teardrop shaped boss that surrounds the ignition switch & leaves just it´s outer surface exposed. Simple installation. Precio original:93.49€ Precio Oferta:50.00€ IVA y portes incluidos. Turn that drab black frame tube under your seat into a real eye catcher. It looks so real that you can hardly tell it´s just a cover. 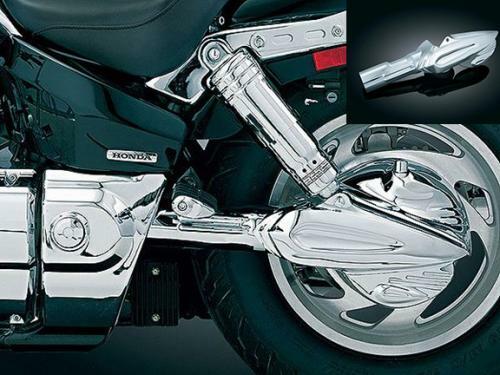 When added to our Boomerang Frame Cover, it looks like you´ve chromed the whole frame! Quick & simple to install. Precio original:99.50€ Precio Oferta:40.00€ IVA y portes incluidos. On a finely finished bike like the VTX, you don´t want an ugly weld showing on an otherwise decent shift lever. In a heartbeat you can cure this with our creamy smooth chrome cover. Precio original:28.54€ Precio Oferta:13.00€ IVA y portes incluidos. Want to sparkle up that drab stock belt guard? This accent is easily added to the lower belt guard to protect the OEM belt while covering the black plastic. Wow, what a difference! Precio original:128.90€ Precio Oferta:45.00€ IVA y portes incluidos. Precio original:65.00€ Precio Oferta:30.00€ IVA y portes incluidos. Precio original:105€ Precio Oferta:45.00€ IVA y portes incluidos. Get rid of Kawasaki´s stock dash plate in favor of the Cobra billet plaque. It comes in Fluted and Smooth styles. You´ll never go back to stock. Precio original:195€ Precio Oferta:78.00€ IVA y portes incluidos. Precio original:215€ Precio Oferta:68.00€ IVA y portes incluidos. Precio original:77€ Precio Oferta:32.00€ IVA y portes incluidos. Precio original:50€ Precio Oferta:27.00€ IVA y portes incluidos. Precio original:50€ Precio Oferta:23.00€ IVA y portes incluidos. Precio original:45€ Precio Oferta:23.00€ IVA y portes incluidos. Precio original:90€ Precio Oferta:40.00€ IVA y portes incluidos. Designed to replace unsightly stock oil caps as well as oil dip sticks on some models, Cobra´s best billet bits are machined right and made to fit just like they came from the OEM. Precio original:40.00€ Precio Oferta:23€ IVA y portes incluidos. Precio original:38.50€ Precio Oferta:19.50€ IVA y portes incluidos. Give a new look to your calipers and brighten up a dark area Constructed of CNC-machined, chrome-plated billet aluminum Choice of Fluted or Swept designs Made in the U.S.A.
Precio original:50€ Precio Oferta:32.00€ IVA y portes incluidos. 120€ Precio Oferta:55.00€ IVA y portes incluidos. Precio original:55.50€ Precio Oferta:25.00€ IVA y portes incluidos. Precio original:41.32€ Precio Oferta:21.00€ IVA y portes incluidos. Perfectly proportioned and ultra stylish, Cobra reservoir covers are essential handlebar treatments. Available in the following styles for most cruisers: Scalloped, Smooth, Fluted or Swept. Precio original:44.08€ Precio Oferta:20.00€ IVA y portes incluidos. Precio original:37€ Precio Oferta:19.00€ IVA y portes incluidos. Top off your radiator--but not with antifreeze. Cobra slick billet radiator cap cover hides the ungainly stock item without interfering with the accessibility of the cap. A single setscrew holds the cover securely in place. Precio original:60€ Precio Oferta:32.00€ IVA y portes incluidos.